Well, November definitely brings in the chill, up here in the north country, but for you folks down in warmer climes that have been suffering in the heat, I hope November brings you some relief. Yippee! Got my Pugs 2 back form the bike shop, yesterday and it is now a single speed or actually a double speed. More on that in a bit. Anyway, here it is, with a few other mods. Pretty good deal on it, by the way. My guy at the shop did all the labor at no cost in exchange for the shifters and cassette that was on the bike. Me, I supplied the parts, up front. To further lighten the bike, I also replaced the stock Moloku handlebars with a much lighter FSA flat bar. I love the Moloku bars, but they're really a heavy duty touring handlebar, with emphasis on heavy, since they're made of steel. The FSA bar is MUCH lighter and better suited for trail work, anyway. Besides, I can always go back to the Moloku anytime I wish. Yes, this is actually a double speed, you might say. It's a standard single speed in the back. This version of the Pugs, though, is unique in that it uses the same width axle, front and back, plus the front hub is threaded for a free wheel. What this allows you to do is run the front wheel with a different size cog, then just switch front and back wheels to change the gearing. 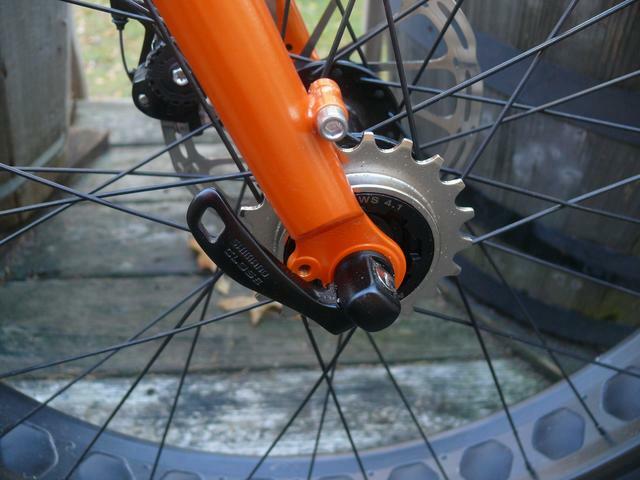 Here's the front wheel with a smaller cog that I will use when I want a higher gear. 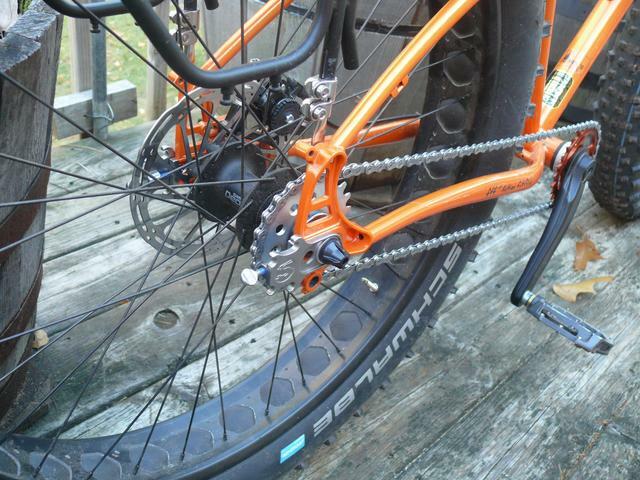 Right now, the gearing is with the rear wheel, set very low for trail work, with a nod to some snow riding or mud riding. My trails are very dry at the moment, so the gearing is a bit lower than I would like, but still very useable. Should be just right, though, when things turn mushy and soft. Then, too, I can always switch wheels to get a higher gear. Did 6 miles of trail work, late afternoon, and loved the way the bike handled. It handled nice with the full set of gears and the heavy stock handlebar, too, but now it handles even better with the reduced weight, plus no big derailleur to snag or break hanging from the back. I now have single speed bikes all the way from a skinny tire road bike all the way up to a fat bike. Speaking of late afternoon, don't forget, Daylight Savings time ends this Sunday. Pretty much means my late afternoon rides will become more like mid-afternoon rides, being this far north. Last edited by Crankin; 11-02-2018 at 01:17 PM. Happy BD, Crankin. I do hope you get a chance to do a little ride, just to say you did on your birthday. We have some of that wet weather coming in over the weekend, too, but looks like we'll get some snow mixed in, too. Oh, well. This is November. Cold and cloudy, this morning, but did 14 miles of pavement on the Nature Boy, then came back and did 2 more miles on the trails with the Krampus. So glad I didn't sell the Krampus, even though I was tempted. Now that I've got it the way I want it, it's a keeper. Took a different set of tires, then converting to tubeless and, of course, doing a single speed conversion, not to mention a different handlebar, stem, seat post and seat to get there, but I'm enjoying it MUCH more now than I did when it was all stock from the factory. Out of the box, it was actually a little disappointing and I usually love Surly bikes. Fun, fun ride, now. Last edited by north woods gal; 11-02-2018 at 10:49 AM. On the Krampus? Those are Maxxis Chronicle 29x3s, 120 tpi, set up tubeless. That's what I used to replace the stock Surly Dirt Wizards, which were a very aggressive dirt tire, but also a very slow rolling tire. The Chronicles are, as usual for me, a XC tread tire. Very fast and pleasant rolling tires that do well in the sand, but clog up a bit in the mud, but the important thing, now that the Krampus is a single speed, is that they roll easy. First snow ride of the year, this morning and, also, my first ever single speed snow ride. There I was, yesterday, riding my single speed setup Pugs 2 on my hard dry trails, wondering if maybe I went a bit too low on the gearing and thinking maybe I should change out to a slightly faster cog in the rear. Woke up, this morning to snow falling and by the time I hit the trails with the Pugs, had 2 to 3" of wet, glue-like snow. The gearing I chose was perfect for this work. Riding a single speed fat bike for some snow riding was exactly what I had in mind for the Pugs and looks like I got it just right. Did 3 miles of trail riding in the thick snow. Lots of fun, but lots of work, too, so got my daily does of exercise. So did Star, who loved her first snow outing of the season. Looks like my pavement riding may be on hold for a day or two until the temps melt off the snow. Of course, I could just ride one of the fat bikes, too. So jealous! If we had snow, I wouldn't feel guilty about not riding and I could maybe x country ski???? Sheila, you didn't miss my birthday, it's today. Ended up hiking about 10.5 miles over 2 days, one at home, yesterday, and today in western MA. Off to finish my birthday celebration at my son's house. We had a great dinner with our friends' last night. And grandchild #3 arrived Friday afternoon. It's a boy! He looks like he was born weight lifting. Congrats on the new grandson. That's a great birthday present. Most of the snow melted, overnight, due to rain, but this snow/rain pattern is forecast to continue most of the week and by the weekend, temps will not even get above freezing, so, yeah, winter is here for us. Had hopes it would hold off a bit longer to get more November trail riding done, but, I'll just have to take it one day at a time, now. Crankin, I wouldn't let the guilt get to you for not riding. As long as you can get outdoors, that's the important thing. Up here, we have to fight SAD (seasonal affective disorder) because we get so little light in the winter months. Our long, dark and gloomy winters can be very depressing. Always a challenge, but winter can be beautiful, up here, too. The best cure for SAD is to get outdoors, every day, and soak up as much light as possible. I never skip my daily outdoor time. Winter bike riding is my first choice, but I also cross country ski and snowshoe, all depending on snow conditions. Yeah, gloomy, today, but hope to be able to do some pavement riding. Last edited by north woods gal; 11-05-2018 at 06:57 AM. I'd say I get outside 4-5/7 days. It doesn't always happen on the 3 days I work, but usually I can get out for an early am ride most of the year, or a walk before, during, or after work on one of those days. I love my 2 bootcamp days, but on Friday, I often want to ride because I am not at work, and after that class, it's pretty hard! I tell all of my clients to get outside in the winter and they just can't do it. The ones who already do some exercise are more successful, but most just complain. I've been dealing with winter that way for about 18 out of the 28 years since we moved here from AZ. I always went out and played in the snow with my kids, shoveled, and even did some minor x country skiing for the first few years. They did downhill skiing, which I had no desire to do. It wasn't until I started riding in 2000 that I started seriously x country skiing, snow shoeing, and winter hiking and walking. I knew it wasn't my imagination, we've had 6 more inches of rain this year than normal. It has put a crimp in my outdoor stuff. 4 or 5 days out of seven riding or other outdoor activity is pretty good for someone still working and/or raising a family. Back when I was doing both, there were weeks when I couldn't keep that pace. Yeah, retirement is great in that respect. Our weather has been consistently wetter than usual this year, too. Today was another ride in the rain day, only this time it was half rain and half freezing rain. Started out mid-morning with some blue peeking though the clouds, then the low clouds would move in and soak me with the wet stuff. Managed 11 miles of local pavement, but the wet clothes and temps in the 30s got the best of me, so I and headed home to dry off and warm up. My legs wanted to to do much more than 11 miles, though. Rested a bit, then traded the Gunnar for the Krampus and hit my trails, hard, doing 6 miles of fast laps. By this time the rain had stopped, so a great trail workout. While riding the trails, came across two downed trees across my trails, though. Not real big, but had to be cleared. Called the riding quits and grabbed an axe and went to work. Between the riding, the rain and the cold and the heavy work of tree removal, I was one tired gal, today. Definitely got my outdoor time, today. Rain, and me riding in the rain, is beginning to seem normal, now. Yup, another wet ride, this morning. Rode the 2 miles over to our town hall to vote, then kept going for another 9 miles of pavement work. Got home, dried off the Nature Boy, then headed out for 4.5 miles of very wet and sloppy trail work with the Pugs. 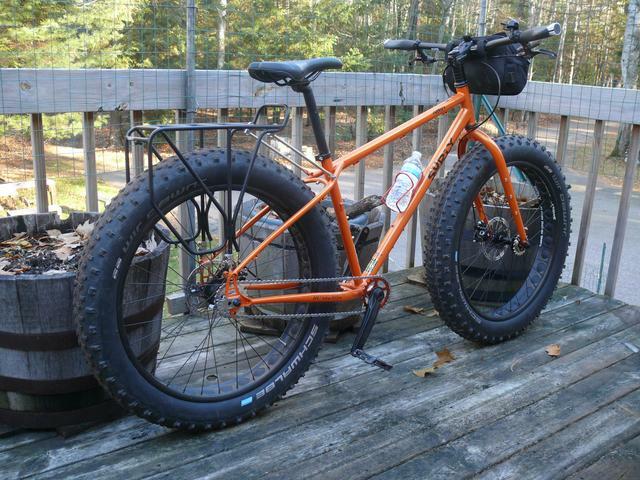 The Pugs with its 4.4" tires is a true fat bike and very comfy and safe to ride on the trails, but those big wheels are harder to push than the Krampus and, especially, the Log Lady. 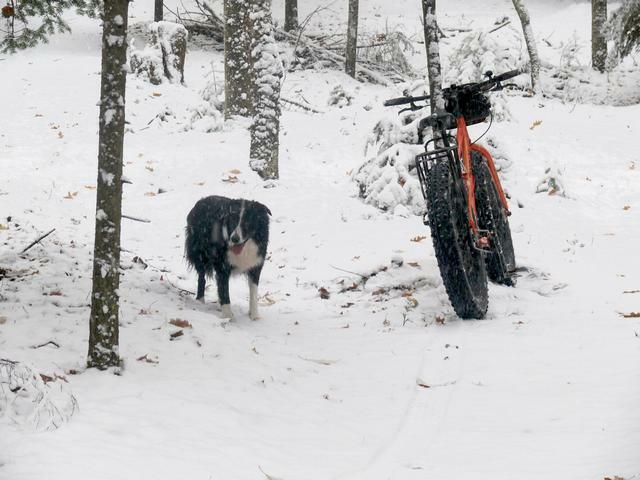 When the going gets sloppy, though, fat bikes rule. Yeah, but it has that goofy curved handlebar. Actually, I like them, too. Just that this old body resists getting stretched when I go back and forth between MTBs and road bikes. Thanks to my accident, my neck also complains, now, when I'm not in a fairly upright position. No more riding in the drops for me. Lots of great memories on all the drop bar bikes I've owned over the years, though. My favorite was a Trek Ultegra equipped cyclocross bike with one of the very last aluminum frames actually made in Wisconsin. That was an amazing bike. Snow, again, tonight. Really had hoped to get some nice dry November weather got riding, but not looking good. Every day I can ride my Nature Boy or standard tire MTBs is now precious. Fat bike, only, weather is closing in, fast. Last edited by north woods gal; 11-06-2018 at 04:31 PM. First ride in November turned out to be one of the hardest ones I've done this year. Up until last night, there was only a long ride for the group, and while 37 miles I can do, I can't keep up with the group that does the longer rides. Then, later in the evening, someone volunteered to lead a shorter version. Of course, it included a dreaded climb. The whole ride was in my old neighborhood, where I used to live when I first moved back to MA, about 15 miles north of here. I did not ride when I lived there and man, I doubt I would have continued, as it is super hilly. The leader of this ride is someone who is good, but he was setting a fast pace. I wasn't back with sweep, but I was never in the front, either. However, it's a beautiful day, 61 degrees and breezy with sun. Yes, the sun did come out. I always feel crappy in the beginning of a ride and by the time that wore off, we were near the climb. However, I forgot about the climbs after the climb . There is a former pig farm on a road that runs parallel to my old street and it's a 12% grade to this spot. It's a CSA now, so I guess it's all upscale. The first day my kids rode the school bus (ages 5 and 8) they asked me if we had moved to Appalachia . So, it is rural and beautiful. But the climbing after the climbing almost killed me. Made it back to my car at Great Brook Farm and I was so tired and hungry, I did not go to the lunch, as it was going to be quicker to drive home and eat than wait at the place they were at. Glad I did it, but a reminder that I need to get my azz in gear for next year. I am talking with my bootcamp instructor about a couple of months of personal training. 26 miles with 1350 ft of climbing. Some serious climbing with gradients like that. We're also mostly hills, but a lot gentler in nature. Would definitely have to work myself up to that stuff you rode. Good job on your part. Hey, send some of that sunshine and warm weather our way, especially the sunshine. Another dreary, cold, snowy day for us. Light skiff of snow, overnight and some light snow falling as I rode my trails on the Norco Sasquatch fat bike. Did a good 6 miles, pushing myself hard in the climbs. Good workout. Being the glutton for work that I am, I then spent another two plus hours smoothing out a very bumpy section of trail. No pavement riding, today, though. Figure I'll get plenty of that when the snow closes down my trails and I'll be riding the fat bikes out on our plowed roads. For now, I'm riding trails, every day, and pavement, every other day. Want to enjoy my trails while I still can. No one plows them for me. Finally, conceding that my winter biking season is actually, here, I pulled the Norco Bigfoot out of summer storage and got it ready to go. 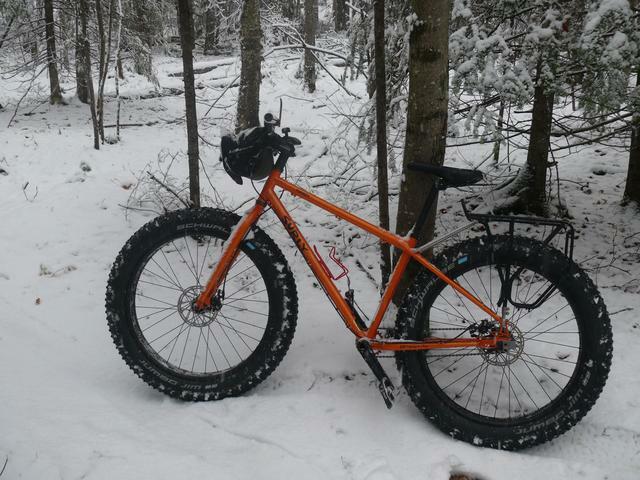 This is a snow bike, only, fat bike because of its big aggressive studded tires. 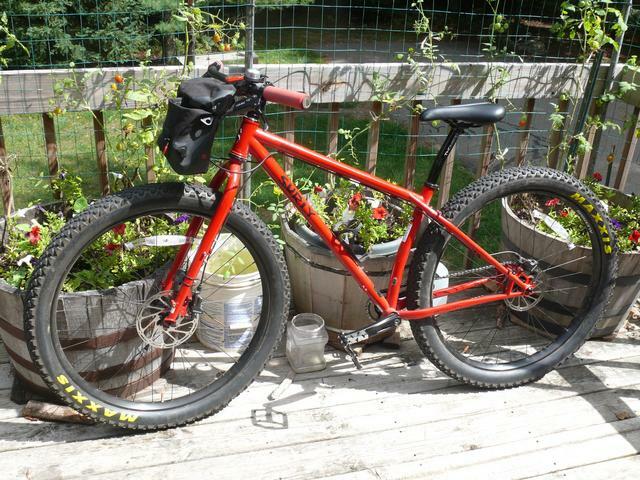 (My other Norco, the Sasquatch, I ride year round.) Figured I might as well be ready when the deep slushy snow hits. Won't be long, now. Yeah, my husband is in Chicago and he said he is glad he is leaving tomorrow late morning, because it is going to snow there shortly after that. We are getting rain on Friday, but there will be some snow in northern New England.